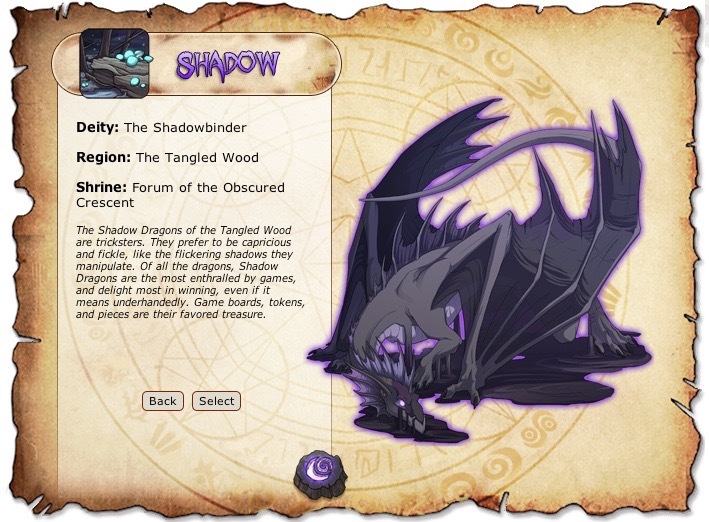 Flight Rising: Theme Week – Deities! by Jen February 19, 2014 November 12, 2017 0 comments on Flight Rising: Theme Week – Deities! What can you do with a Flight Rising dragon that you really need to get out of your Dragon Lair? One option is to exalt it. When that happens, the dragon goes to live with one of the many dragon Deities. Flight Rising has started doing really fun Theme Weeks in the “Dragon Share” Forum. The theme for Week 3 is: Deities! All of the artwork you see in this post are copyright of Flight Rising. What happens when a dragon gets exalted? From a lore perspective, that dragon goes to “serve a higher cause” and gets to live with a particular Dragon Deity. Or, you can look at it a bit more functionally. Dragons that get exalted are removed from the game. They no longer exist in any player’s Dragon Lair, and they can no longer be bred and produce babies. It is a good way to prevent the “in-game” dragons from growing at an exponential rate – forever! A player exalts a dragon, and that dragon goes to live with the Dragon Deity that the player selected when he or she started playing Flight Rising. I picked the Shadow Flight. So, the dragons I exalt “serve a higher cause” with the Shadowbinder. There was more than one way to participate in Theme Week 3: Deities! A player could share the dragons that match the Dragon Deity of their Lair. Or, they could share their dragons that match up with any of the Dragon Deities. I decided to share two of my shadowy dragons. India is a female Fae. She is a lovely, dark, shadowy dragon. Smokey is also a female Fae. She is a lighter shade of shadow (and all dressed up). I highly recommend that you take a few minutes to check out all of the dragons that were shared in the “Dragon Share” Forum for the Theme Week: Deities! For me, this was the most difficult theme to match up with. It seems like a lot of other people had a really easy time!